Dubai . New year . Christmas . Middle East . Activities . Attractions . There’s no better spot to witness Dubai’s biggest lighting shows and fireworks than from the footsteps of the Burj Khalifa. Adorned with dazzling lights and bridal-like décor, the iconic building promises the perfect end-of-year celebrations complemented by live bands and DJ’s. What’s more? This grand architectural marvel showcases the glamorous Dubai fountain alongside, which brightens up the New Year’s Eve with spectacular water shows and scintillating sounds. Pro Tip: Access to the Downtown Dubai is restricted in the night for crowd control. To enjoy a seamless experience, plan ahead and arrive as early as 7pm to grab a top spot, or alternately book a hotel near Burj Khalifa for easy access to the site. Experience the glitz and glam of the New Year’s celebration at the 11 km boardwalk in Palm Jumeirah. Fireworks here beautify the skyline in the shape of a palm and offer splendor that makes it difficult to believe that you’re on earth. In fact, hotels in the Jumeirah complex boast of special viewing spots to glance at the mesmerizing panoramic views of the glitzy Dubai skyline. 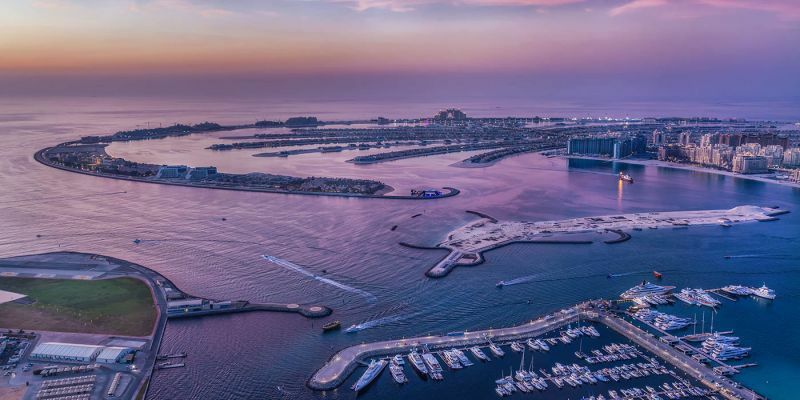 Moreover, the luxury restaurants on the Palm Jumeirah host a yummy gala dinner all night, whereas pubs and nightclubs offer rocking live music with international celebrities and bands playing under the stars. 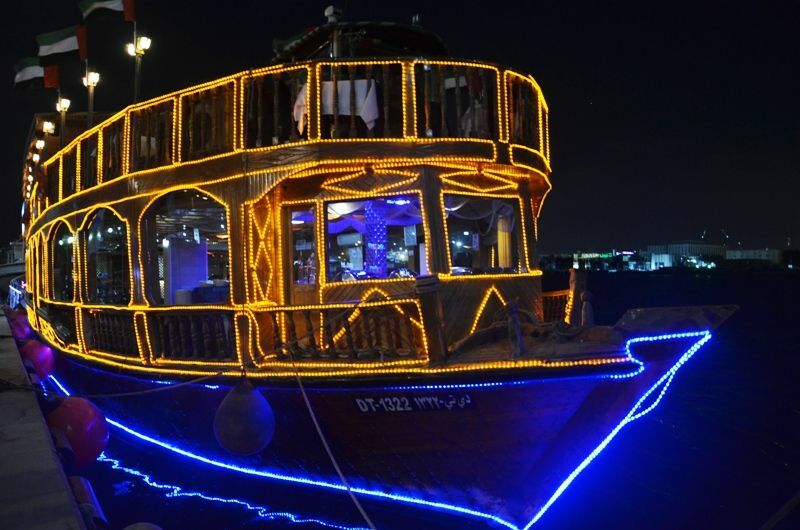 Glide through the heart of Dubai on a beautifully lit cruise as you enjoy the spectacular fireworks lightning up the sky and savor an assortment of flavors on board. The three-hour dinner and entertainment cruise ensures that you and your loved ones get to relish a memorable New Year experience for a price that does not dig a hole in your pocket. The spell-binding view from the open air upper deck of the dhow cruise will stun you with striking scenery of Dubai striding past you slowly. What’s more? Other than a delectable menu of international cuisine, there would be a midnight cake, champagne, and of course the varied entertainment options including dance, songs and music. So, why wait? Say Hello to the New Year amidst the cool waters and feast in style with positive vibes and great music! Say ‘Ahlan Wa Sahlan’ (Welcome!) to the New Year away from the chaotic hustle-bustle of the city, in the adventurous realms of the desert. 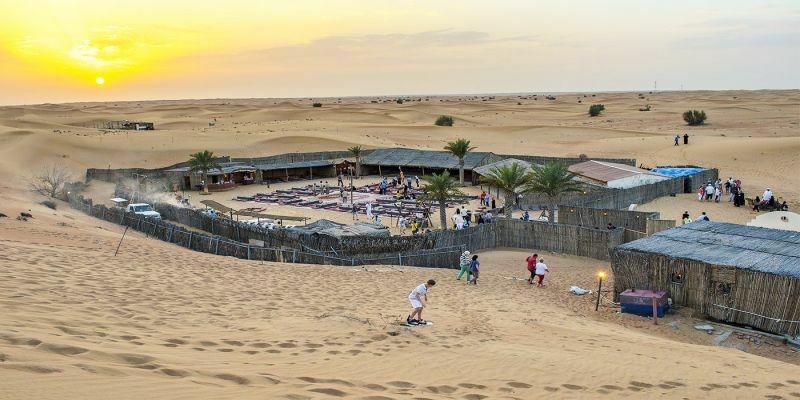 From mesmerizing sunset views to dune bashing to a colorful evening lined with a range of activities– a desert safari is a great way to bring on the New Year in the most traditional manner. Pro Tip: You can also dress up in the local Arabic clothes and enjoy photo sessions to cherish the memories for a lifetime. 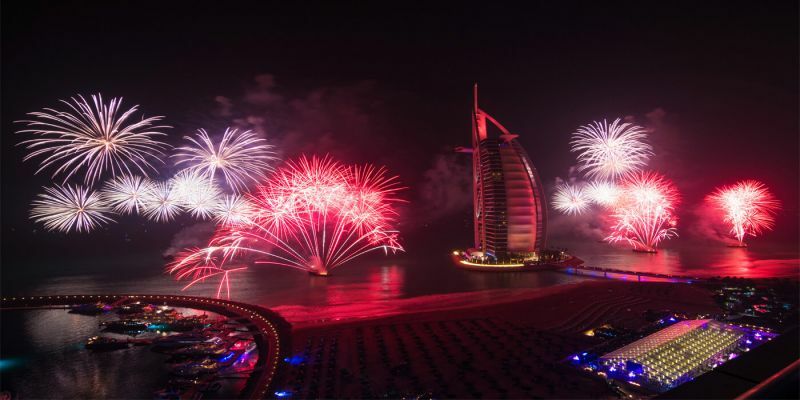 With the Burj Al Arab in its neighborhood, Dubai’s vast coast line is unsurprisingly jam-packed with NYE revelers and merrymakers. Away from the chaos and mundane glitter of the city, Jumeirah beach serves the perfect venue for those who love celebrating the New Year in the close proximity of their loved ones. Just pack a picnic basket, take along a mat and enjoy the sound of the water waves as a new year of love, hope, and inspiration dawns upon you. Jumeirah beach features a wide variety of cafe-style eateries catering to Dubai’s famous Salt for scrumptious sliders. Pro Tip: Just like other crowded places during the New Year, it’s best to get there early and reserve your spot. Perhaps, it is recommended to arrive there in time so you can catch the breathtaking sight of the sunset before settling in for the night. 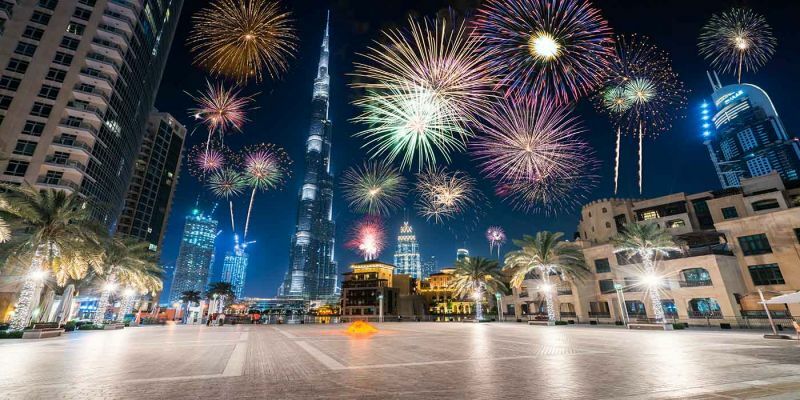 Did you know that Dubai plays host to some of the craziest New Year parties in the world? So, if you are looking for sickest electronic and hip hop beats, come shake your belly and dance your way into the New Year like never before. From rocking live music to celebrity performances to amazing food and drinks all night, there is no better way to welcome the New Year. 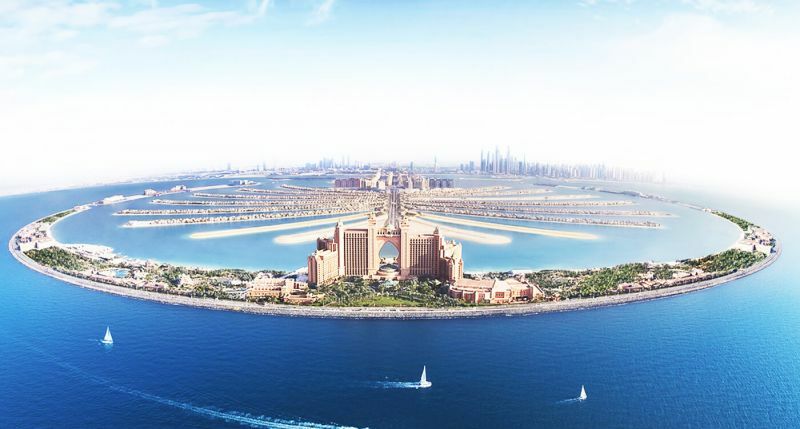 Some of the most popular places to party include Barasti Bar, Mina Seyahi, and yes, the Atlantis on the Palm which is simply the best place for a new year party in Dubai. Last but not the least, Sandance Beach at the Atlantis also promises to bid a night full of live entertainment! 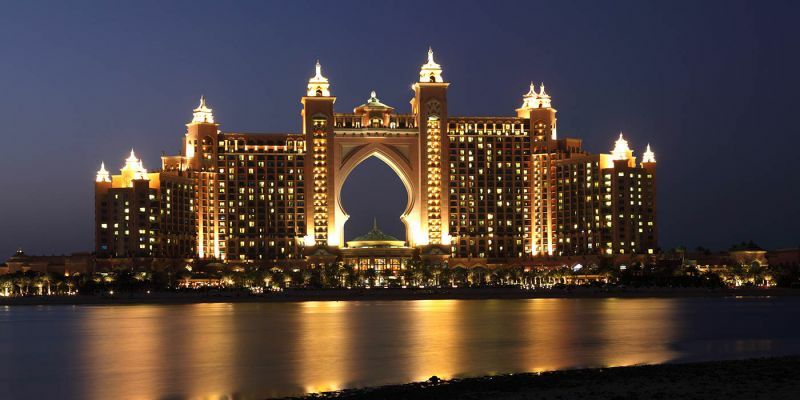 Whether you prefer a yummy gala dinner gazing at the spectacular fireworks or a simple glass of champagne shared with a small group of friends, Dubai Tours offer an unmatched dimension!